"Naval Special Warfare Command" redirects here. For the Thai Naval Special Warfare Command, see Naval Special Warfare Command (Thailand). 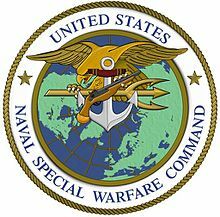 The United States Naval Special Warfare Command (NAVSPECWARCOM), also known as NSWC or WARCOM is the Naval component of United States Special Operations Command, the unified command responsible for overseeing and conducting the nation's special operations and missions. Naval Amphibious Base Coronado, San Diego County, California, U.S. Originating in the unconventional naval units formed during the Second World War, NSWC was established on April 16, 1987 at Naval Amphibious Base Coronado in San Diego, California. Its mission is to provide leadership, doctrinal guidance, resources and oversight to special operations carried out in maritime and littoral environments. NSWC specializes in a broad range of tactical areas, including unconventional warfare, direct action, counterterrorism, special reconnaissance, and personnel recovery. NSWC is organized primarily around eight Navy SEAL teams, three special boat teams, and various supporting commands, totaling approximately 9,200 personnel. Units can operate independently, as part of U.S. Navy carrier battle groups and amphibious ready groups, or integrated with other U.S. special operations forces. By utilizing the Navy's ships, submarines, and overseas facilities, NSWC forces can be deployed rapidly almost anywhere in the world. Today's Naval Special Warfare operators can trace their origins to the Scouts and Raiders, Naval Combat Demolition Units, Office of Strategic Services Operational Swimmers, Underwater Demolition Teams, and Motor Torpedo Boat Squadrons of World War II. In the Vietnam era, the Navy drew most of its SEALs from the Underwater Demolition Teams; from the early 1960s up until 1983 the SEAL Teams and UDTs coexisted. Navy SEALs typically traced their origin to the Scouts and Raiders while the Underwater Demolition Teams traced theirs to the Navy Combat Demolition Units (the Navy drew its UDTs from NCDUs). However, in 1983 the Underwater Demolition Teams were merged with the SEAL Teams. This, in turn, merged their ancestry. While none of those early organizations have survived to present, their pioneering efforts in unconventional warfare are mirrored in the missions and professionalism of the present Naval Special Warfare warriors. To meet the need for a beach reconnaissance force, selected Army and Marine Corps personnel assembled at Amphibious Training Base Little Creek, Virginia, on 15 August 1942 to begin Amphibious Scouts and Raiders (Joint) training. The Scouts and Raiders mission was to identify and reconnoiter the objective beach, maintain a position on the designated beach prior to a landing and guide the assault waves to the landing beach. An extensive history of Naval Special Warfare, written by men who actually served in the various units, is available at the National Navy UDT-SEAL Museum website, with a matchless collection of artifacts from that era on display at the facility. The Navy Scouts and Raiders were created before the Navy Combat Demolition Units (NCDUs). The Scouts and Raiders were first formed 15 August 1942, nine months after the attack on Pearl Harbor, from the Observer Group, a joint Marine Corps–Army–Navy unit. The Observer Group was the first unit trained in amphibious reconnaissance. They trained in inflatable boat insertions from submarines around the Chesapeake Bay and at the Amphibious Training Base (ATB) Little Creek in Virginia and in Fort Pierce, Florida. They were training for an intense clandestine mission in North Africa. With US Marines limited to the Pacific Theatre of Operations, the Observer Group was disbanded, with the Marine Corps counterpart forming the Amphib Recon Company; the Army/Navy unit formed the Scouts and Raiders with the Army later leaving. The U.S. Navy began the Scouts and Raiders to provide reconnaissance and raiding missions to support amphibious landings. The unit could conduct raids and sabotage missions from a pair of men to platoon-sized operations. The unit continued its deployment to North Africa as planned, where they earned eight Navy Crosses. Robert Halperin, a former NFL football player and future Olympic medalist, received a Presidential Citation and the Navy Cross for his work during the amphibious landings in French Morocco. This was just the first of many war-time missions for the versatile Scouts and Raiders. The first group included Phil H. Bucklew, the "Father of Naval Special Warfare", after whom the Naval Special Warfare Center building is named. Commissioned in October 1942, this group saw combat in November 1942 during Operation Torch on the North African coast. Scouts and Raiders also supported landings in Sicily, Salerno, Anzio, Normandy, and southern France. A combined operations joint US-Australian unit, Special Service Unit No. 1 (SSU 1), was established on 7 July 1943. Its first mission, in September 1943, was at Finschafen on New Guinea. Later operations were at Gasmata, Arawe, Cape Gloucester, and the East and South coast of New Britain, all without any loss of personnel. Conflicts arose over operational matters, and the unit was dissolved. The US Navy personnel from SSU 1 became the basis of the 7th Amphibious Scouts. They received a new mission, to go ashore with the assault boats, buoy channels, erect markers for the incoming craft, handle casualties, take offshore soundings, blow up beach obstacles and maintain voice communications linking the troops ashore, incoming boats and nearby ships. The 7th Amphibious Scouts conducted operations in the Pacific for the duration of the conflict, participating in more than 40 landings. The third Scout and Raiders organization deployed to fight with the Sino-American Cooperative Organization (SACO) in China. Admiral Ernest J. King ordered that 120 officers and 900 enlisted sailors be trained for "Amphibious Roger" at the Amphibious Roger school at Fort Pierce, Florida in order to support this mission. They formed the core of what was envisioned as a "guerrilla amphibious organization of Americans and Chinese operating from coastal waters, lakes and rivers employing small steamboats and sampans." Elements of the third Scouts and Raiders saw active service conducting surveys of the upper Yangtze River in the spring of 1945 and, disguised as coolies, conducting a detailed three-month survey of the Chinese coast from Shanghai to Kitchioh Wan, near Hong Kong. The majority of the force remained garrisoned at Camp Knox in Calcutta, India. In September 1942, 17 Navy salvage personnel arrived at ATB Little Creek, Virginia for a one-week concentrated course on demolitions, explosive cable cutting and commando raiding techniques. The units were organised in a six-man team of an officer, a petty officer and four seamen using a seven-man LCRS inflatable boat to carry their explosives and gear. On 10 November 1942, this first combat demolition unit succeeded in cutting a cable and net barrier across the Wadi Sebou River during Operation Torch in North Africa. Their actions enabled the USS Dallas (DD-199) to traverse the river and insert Army Rangers, who proceeded to capture the Port Lyautey aerodrome. Plans for a massive cross-channel invasion of Europe had begun and intelligence indicated that the Germans were placing extensive underwater obstacles on the beaches at Normandy. On 7 May 1943, Lieutenant Commander Draper L. Kauffman, "The Father of Naval Combat Demolition," was directed to set up a school and train people to eliminate obstacles on an enemy-held beach prior to an invasion. On 6 June 1943, LCDR Kaufmann established Naval Combat Demolition Unit training at Fort Pierce. By April 1944, a total of 34 NCDUs were deployed to England in preparation for Operation OVERLORD, the amphibious landing at Normandy. On 6 June 1944, in the face of great adversity, the NCDUs at Omaha Beach managed to blow eight complete gaps and two partial gaps in the German defenses. The NCDUs suffered 31 killed and 60 wounded, a casualty rate of 52%. Meanwhile, the NCDUs at Utah Beach met less intense enemy fire. They cleared 700 yards (640 m) of beach in two hours, another 900 yards (820 m) by the afternoon. Casualties at Utah Beach were significantly lighter with six killed and eleven wounded. During Operation OVERLORD, not a single demolitioneer was lost to improper handling of explosives. In August 1944, NCDUs from Utah Beach participated in the landings in southern France, the last amphibious operation in the European Theater of Operations. NCDUs also operated in the Pacific theater. NCDU 2, under LTjg Frank Kaine, after whom the Naval Special Warfare Command building is named, and NCDU 3 under LTjg Lloyd Anderson, formed the nucleus of six NCDUs that served with the Seventh Amphibious Force tasked with clearing boat channels after the landings from Biak to Borneo. British Combined Operations veteran LCDR Wooley, of the Royal Navy, was placed in charge of the OSS Maritime Unit in June 1943. Their training started in November 1943 at Camp Pendleton, California, moved to Santa Catalina Island, California in January 1944, and finally moved to the warmer waters of The Bahamas in March 1944. Within the U.S. military, they pioneered flexible swimfins and diving masks, closed-circuit diving equipment (under the direction of Dr. Chris Lambertsen), the use of Swimmer Delivery Vehicles (a type of submersible), and combat swimming and limpet mine attacks. In May 1944, General Donovan, the head of the OSS, divided the unit into groups. He loaned Group 1, under Lieutenant Arthur Choate, Jr., to Admiral Nimitz, as a way to introduce the OSS into the Pacific theater. They became part of UDT-10 in July 1944, with Lt. Commander Choate commanding the unit. Five OSS men participated in the very first UDT submarine operation with the USS Burrfish (SS-312) in the Caroline Islands in August 1944. Beach Jumper Unit One was formed at the Amphibious Training Base at Camp Bradford, Virginia on 16 March 1943 for deception operations to simulate large scale amphibious raids and invasions. On 23 November 1943, the U.S. Marine landing and subsequent battle at Tarawa Atoll emphasized the need for hydrographic reconnaissance and underwater demolition of obstacles prior to any amphibious landing. After Tarawa, 30 officers and 150 enlisted men were moved to the Waimānalo Amphibious Training Base to form the nucleus of a demolition training program. This group became Underwater Demolition Teams (UDT) One and Two. The UDTs saw their first combat on 31 January 1944, during Operation Flintlock in the Marshall Islands. FLINTLOCK became the real catalyst for the UDT training program in the Pacific Theater. In February 1944, the Naval Combat Demolition Training and Experimental Base was established at Kīhei, Maui, next to the Amphibious Base at Kamaole. Eventually, 34 UDT teams were established. Wearing swim suits, fins, and dive masks on combat operations, these "Naked Warriors" saw action across the Pacific in every major amphibious landing including: Eniwetok, Saipan, Guam, Tinian, Angaur, Ulithi, Peleliu, Leyte, Lingayen Gulf, Zambales, Iwo Jima, Okinawa, Labuan, Brunei Bay, and on 4 July 1945 at Balikpapan on Borneo, which was the last UDT demolition operation of the war. The rapid demobilization at the conclusion of the war reduced the number of active duty UDTs to two on each coast with a complement of seven officers and 45 enlisted men each. The Korean War began on 25 June 1950, when the North Korean army invaded South Korea. Beginning with a detachment of 11 personnel from UDT 3, UDT participation expanded to three teams with a combined strength of 300 men. As part of the Special Operations Group, or SOG, UDTs successfully conducted demolition raids on railroad tunnels and bridges along the Korean coast. On 15 September 1950, UDTs supported Operation Chromite, the amphibious landing at Incheon. UDT 1 and 3 provided personnel who went in ahead of the landing craft, scouting mud flats, marking low points in the channel, clearing fouled propellers, and searching for mines. Four UDT personnel acted as wave-guides for the Marine landing. In October 1950, UDTs supported mine-clearing operations in Wonsan Harbor where frogmen would locate and mark mines for minesweepers. On 12 October 1950, two U.S. minesweepers hit mines and sank. UDTs rescued 25 sailors. The next day, William Giannotti conducted the first U.S. combat operation using an "aqualung" when he dove on the USS Pledge (AM-277). For the remainder of the war, UDTs conducted beach and river reconnaissance, infiltrated guerrillas behind the lines from sea, continued mine sweeping operations, and participated in Operation Fishnet, which severely damaged the North Korean's fishing capability. Naval Special Warfare personnel comprise less than one percent of U.S. Navy personnel. SEAL and Special Warfare Combatant-craft Crewmen (SWCC) units operate across the spectrum of conflict and in operations other than war in a controlled manner; their ability to provide real time intelligence and "eyes on target", offer decision makers immediate options in the face of rapidly changing world crises. Navy Special Warfare Trident Insignia worn by qualified U.S. Navy SEALs. SEALs are Special Operations Command's force-of-choice to conduct small-unit maritime military operations which originate from, and return to a river, ocean, swamp, delta or coastline. This littoral capability is considered more important now than ever, as half the world’s infrastructure and population is located within one mile (1.6 km) of an ocean or river. Navy SEALs have distinguished themselves as an individually reliable, collectively disciplined and highly skilled maritime force. Because of the dangers inherent in NSW, prospective SEALs go through what is considered by many military experts to be the toughest training in the world. The intense physical and mental conditioning it takes to become a SEAL begins at Basic Underwater Demolition/SEAL (BUD/S) training. SEAL candidates begin BUD/S training at the Naval Special Warfare Center, NAB Coronado, California. This six-month course of instruction focuses on physical conditioning, small boat handling, diving physics, basic diving techniques, land warfare, weapons, demolitions, communications, and reconnaissance. SEAL Delivery Vehicle Teams' historical roots began during WWII with the earliest human torpedoes to see use: Maiale, used by Italy's Decima Flottiglia MAS, and Chariots, used by British commando frogmen. Naval Special Warfare entered the wet submersible field in the 1960s when the Coastal Systems Center in Panama City, Florida developed the Mark 7, a free-flooding SDV of the type used today, and the first SDV to be used in the fleet. The Mark 8 and 9 followed in the late 1970s. Today's Mark 8 Mod 1 provides NSW with an unprecedented capability that combines the attributes of clandestine underwater mobility and the combat swimmer. The Advanced SEAL Delivery System (ASDS) program that would have provided NSW a new (dry) submersible for long range infiltration missions was abandoned in 2009. However, news reports have stated that USSOCOM have purchased a new dry SEAL Delivery Vehicle called the Dry Combat Submersible and will be become operational around 2018/2019. The exclusive mission of SWCC operators is to expertly drive and provide large-caliber gunfire support on specialized high-tech, high-speed, and low-profile Surface Combatant Craft to secretly infiltrate and exfiltrate Navy SEALs on Special Operations missions worldwide. These missions include direct action on land, sea, coastline or rivers (such as strikes, captures, and ship take downs by Visit, Board, Search, and Seizure), special reconnaissance, coastal patrol and interdiction of suspect ships and surface craft, counter-terrorism operations, riverine warfare, deception operations, search and rescue operations, and foreign internal defense missions. Although SEALs and SWCC undergo different training programs, both are focused on special operations in maritime environments. The SWCC program includes extensive training on craft and weapons tactics, techniques, and procedures. Like SEALs, SWCC must show physical fitness, possess strong motivation, be combat focused, and maintain responsiveness in high stress situations. The SWCC designation is a relatively new Naval Special Warfare career path that is independent of the regular line Navy. Today's Special Boat Teams have their origins in the PT boats of WWII and the "Brown Water" naval force that was created in 1965 at the onset of the Vietnam War. Patrol Coastal and Patrol Torpedo ships are the ancestors of today's Cyclone class patrol ships and Mark V Special Operations Craft. The total number of special operations personnel, including SEALs and SWCC's assigned to Naval Special Warfare Command is approximately 8,195 out of a total 8,985 military staff, and 10,166 including civilian support staff. Naval Special Warfare Group 10 was established at Virginia Beach, Va. on May 25, 2011. NSW is committed to combating the global terrorist threats. In addition to being experts in special reconnaissance and direct action missions, the skill sets needed to combat terrorism; NSW is postured to fight a dispersed enemy on their territory. NSW forces can operate from forward-deployed Navy ships, submarines and aviation mobility platforms as well as overseas bases and its own overseas units. In response to the attacks on America 11 September 2001, Naval Special Warfare forces put operators on the ground in Afghanistan in October. The first military flag officer to set foot in Afghanistan was a Navy SEAL, Rear Admiral Albert Calland, in charge of Special Operations Command Central (SOCCENT), which was responsible for all special operations for Central Command. Additionally, a Navy SEAL captain commanded Combined Joint Special Operations Task Force (CJSOTF) South. Commonly referred to as Task Force K-Bar, the task force included Navy, Army, Air Force and Coalition Special Operations forces. During Operation Enduring Freedom, NSW forces carried out more than 75 special reconnaissance and direct action missions, destroying more than 500,000 pounds of explosives and weapons; positively identifying enemy personnel and conducting Leadership Interdiction Operations in the search for terrorists trying to escape by seagoing vessels. Operation Red Wings, a counter insurgent mission in Kunar Province, Afghanistan, involved four Navy SEALs and took place on 28 June 2005. The SEALs were on a mission to try to find a key Taliban leader. However, goat herders stumbled upon their hiding place and alerted local Taliban fighters, and they were subsequently surrounded by Taliban forces. The four SEALs requested back up after the Taliban had surrounded them. In the attempt to rescue the four SEALs on the ground a Boeing CH-47 Chinook containing members of SEAL delivery team one and several Army "Nightstalker" pilots was shot down. At the time, this was the biggest single loss of life for Naval Special Warfare forces since World War II. A firefight ensued, killing three SEALs. The fourth, Marcus Luttrell, was protected by local villagers and later rescued by the U.S. military. The team leader, SEAL Lieutenant Michael P. Murphy, was posthumously awarded the Medal of Honor. SEAL Senior Chief Petty Officer Dan Healy was awarded the Bronze Star with Combat "V" for Valor, Purple Heart, and Afghanistan Campaign Medal, posthumously. SEAL Petty Officer Second Class Michael A. Monsoor was posthumously awarded the Medal of Honor for actions in Ramadi, Iraq. Much of this text in this article was taken from Official U.S. Navy SWCC web site which as a work of the U.S. Government is presumed to be a public domain resource. ^ SOCOM Public Affairs (2014). SOCOM Fact Book 2014 (PDF). SOCOM Public Affairs. Archived from the original (PDF) on 4 December 2013. Retrieved 21 April 2014. ^ "United States Naval Special Warfare Command". U.S. Navy. Archived from the original on 19 June 2010. Retrieved 4 September 2012. ^ "Naval Special Warfare". U.S. Navy. Archived from the original on 14 February 2008. Retrieved 4 September 2012. ^ a b c "Navy SEAL history". ^ Shinn, lstLt Leo B. (April 1945). "Amphibious Reconnaissance". Marine Corps Gazette 29 (4). ^ a b Bruce F. Meyers, Swift, Silent, and Deadly: Marine Amphibious Reconnaissance in the Pacific, 1942–1945, (Annapolis, MD: Naval Institute Press, 2004). ^ Kenan Heise (9 May 1985). "Robert Halperin, 77, War Hero, Executive". Chicago Tribune. Retrieved 11 July 2011. ^ "Scouts & Raiders history". Archived from the original on 26 February 2008. Retrieved 2 January 2008. ^ "NSW - Naval Special Warfare Command: History". Archived from the original on 21 September 2013. Retrieved 11 August 2013. ^ a b Butler FK (2004). "Closed-circuit oxygen diving in the U.S. Navy". Undersea Hyperb Med. 31 (1): 3–20. PMID 15233156. Retrieved 19 March 2009. ^ "OSS History". Retrieved 2 January 2008. ^ "NAVSOC mission". U.S. Navy. Archived from the original on 12 January 2008. Retrieved 21 January 2008. ^ "Official U.S. Navy SEAL Information Website, Into". Archived from the original on 16 January 2008. Retrieved 21 January 2008. ^ "Naval Auxiliary Landing Field, San Clemente Island". Naval Base Coronado. United States Navy. Retrieved 18 November 2008. ^ "BUD/S (Basic Underwater Demolition / SEAL) – Naval Special Warfare Center". Official U.S. Navy SEAL Information Website. United States Navy. Archived from the original on 13 February 2007. Retrieved 21 January 2008. 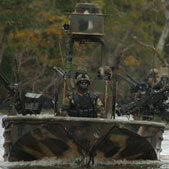 ^ "Navy SWCC – The Navy's Elite Boat Warriors". NavySEALs.com. Archived from the original on 24 December 2007. Retrieved 2 January 2008. ^ "Naval Special Warfare Welcomes Group 10 to Force". navy.mil. 26 May 2011. Retrieved 3 January 2018. ^ Menzie, Christopher (8 August 2008). "Naval Special Warfare Reserve Command Renamed". U.S. Navy. Retrieved 1 October 2011. ^ "Special Operations Forces, Fiscal Year 2014 p.46" (PDF). Government Accountability Office. July 2015. Retrieved 2 June 2016. ^ Communication, Mass. "Naval Special Warfare Welcomes Group 10 to Force". Navy.mil. Retrieved 7 April 2013. ^ "NSWarrior - Military Forum". MilitaryLTD.com. Archived from the original on 26 March 2012. Retrieved 4 September 2012. ^ "NAVSOC History". Archived from the original on 26 July 2007. Retrieved 2 January 2008. Wikimedia Commons has media related to United States Naval Special Warfare Command. U.S. Naval Special Warfare Command – official site.